What is the basic concept of hobby blogging and pro-blogging?. You should know about the differences between them before starting a blog. The details will help you to move on the right track. Beginners don’t know about the benefits part because they are new and try to understand the issue when they start the blog writing. Things come in the way and create a problem, then they work on the issue to resolve the problem. They search the solution online or offline at any cost. If a blog writer knows the basic concept in advance, then they can avoid facing unnecessary issues from starting. What Is The Big Difference Between Blogger And Pro-blogger? Actually, there is two type of blogger. Blogger & Pro-blogger - First, a blogger wants to express views in simple and get some reward from readers. They are happy with it. Likes, comments, emoji expression are the base of the happiness and they continue with these instruments. These tools provoke them to spent time on the blog as per his convenient scheduled. They are using tools and platform, which are free for them to satisfy the existence of online activity. They don’t spend predefined time for the growth of the blog, they don’t take responsibility to share the content, which is important for readers. Some time blogger misguides the readers by his shared information. This type of activity performed by those bloggers, who are starting the blog site only for entertainment. In other words, you can say that this type of blogging activity uses to learn about the creation of the blog only. They do not fix the time to write the article. The good ways of blogging to assist the readers to know about genuine things, if you are working as a professional blogger. That will make a good image among readers. The blogger.com is the best platform for learning blogger. Free domain (blogspot.com) and hosting help them to create and learn the all online blogging activity. Pro-blogger - A professional blogger clear about the blogging benefits. They read several blogs to know about the technical knowledge of blog making and will eager to collect information about the benefits part of blogging. Because they are spending his precious time over it. If you want to start the blog to earn money online, then you will know about everything related to blogging. The best way to convert your hobby of writing to money-making tools by adopting a simple process. Creativity assists you to generate ways to earn money online. Every earning member and student want to start own business. They invest money in an initial phase of the Establishment and starting the business. That initial money is spent from the budget. This expenditure makes the thought of professionalism. They spend time and try to convert the expending time to generate some money. They take steps to improve the business by using tips and values. They conses to evaluate the profit and loss of his running business. They change his decision for the benefit of business. Actually, they always think about the growth of his small business. These are the example of pro-blogger. 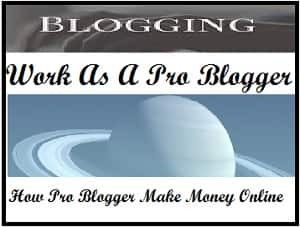 You should be started your blog as a professional blogger. You will be read top blogger blog to know about the tips and tricks they use to be a successful blogger. The best platform is blogger.com & wordpress.com to start the blog. As a professional blogger, purchase a domain with hosting for your blog. This expenditure should be spent on your pre-decided budget for your small online business. You can hire a content writer, who has experience in this field. Some expenses will be there on purchasing of laptop and network hiring. Your laptop should be capable to store large file and data. So, be cautious at the time of purchasing electronic devices. Take an expert opinion. Making the site to follow up the SEO terms and conditions and familiar with the search engine. Now start writing the unique content for your readers. Your small business came to the floor. Social media is the biggest tools available to flourish your content among the people worldwide. Spend some money to hire the best social media platform to share your content with people. That will save your time and expenses to hire a person to do this job. Advertise your blog through print media houses with title and description. The motive should be also reflected there. The best advertisement is available online. Spend money to display your blog ads online. Google, Bing, Twitter, Facebook, and other platform provide facility to display your ads on large scale. These ads work very effectively to get the popularity of the blog in a very short time period. They give the offer to pay only if a viewer clicks on your ads. Revenue analysis is a very important part to start a small business as entrepreneurship. First, calculate the expanse and prepare the excel to submit the expenditure to calculate the benefit and lose on monthly basis. You know that every business carries a small investment. Wrong expenses low your budget and increase pressure on you. So, analyze the market and compare the price of tools, choose the best in low price rate. Focus to expanse could not be crossed the budget limit and sufficient revenue is saved for the future. You start blogging to generate jobs for other youngsters. Motivate through your literature. Generate a good working culture for the new generation. Save money, if your blogging passion starts to earn money. Now ready your blueprint to start your own blog as a small online business. Start blogging as a Pro-Blogger !.